When Isaac was old and he could no longer see, Jacob wore Esau’s clothes and covered his hands and neck with goatskins in order to deceive his father. Isaac became old, his eyesight failed and his health began to deteriorate. Approximately how old Isaac was at this time can be determined by first noting that his son Jacob was 130 when he entered the land of Egypt (Genesis 47:9). Joseph was thirty years old when he entered the service of Pharaoh King of Egypt (Genesis 41:46). After 7 years of plenty and 2 years of famine, Joseph was approximately 39 years old when Jacob came down to Egypt. Knowing that Jacob was 130 years old when he came down to Egypt and Joseph was 39 at that time, we can calculate by subtraction that Jacob was 91 years old when Joseph was born. Joseph was born after Jacob worked 14 years for his uncle Laban to pay the bridal prices for his two wives (Genesis 30:25). Therefore, Jacob left home and arrived at Laban’s when he was 77. Since Jacob was born when Isaac was 60, this means Isaac at this time is about 137 years old. Isaac was over 137 years old and he could no longer see. He probably also considered that Ishmael, his half-brother, had died at 137. Therefore, he called for his son Esau to prepare a last meal for him before he dies. But according to Genesis 35:28, Isaac lived 43 more years and died at 180. Isaac’s physical blindness was symbolic of his spiritual blindness. In his haste to pronounce a blessing over Esau, Isaac failed to see the character flaws in his eldest son and the necessity of God's spiritual choice over the natural order of the firstborn by birth. The prophecy given to Rebekah before the birth of Esau and Jacob stated that Jacob would be the ruling son. In addition, Esau had shown himself to be a self-centered and foolish man. Esau so disregarded his position in the family that he sold the birthright of the first-born son to his brother for a bowl of red lentil stew. Surely, Esau was not worthy of the blessing. Rebekah may have heard Isaac call out to Esau, watched him enter his father’s tent and then listened to the conversation. Isaac had said that he wanted to give Esau his blessing in the presence of the LORD (Yehovah). This was to be a solemn blessing witnessed by the LORD, pronouncing it in His Name and authority. Rebekah knew of the prophecy that her older son Esau would serve his brother and understood that Jacob was the one who should receive the blessing. But instead of entreating her husband and reminding Isaac of what the LORD had told her, she devised a plan to have her son Jacob deceive his father. Although she went about it all wrong, Rebekah was inspired by her faith in the divine promise and was confident that Isaac would not be able to curse Jacob. Rebekah provokes her son to follow her wishes in spite of his fear. Jacob obeyed his mother and fetched two choice young goats. Rebekah seasoned the meat and cooked them to her husband’s liking. Realizing that Esau would be gone for awhile, Rebekah dressed Jacob in his brother’s clothes. To complete the disguise, she covered Jacob’s hands and neck with the goatskins so that he would feel hairy to his father’s touch. 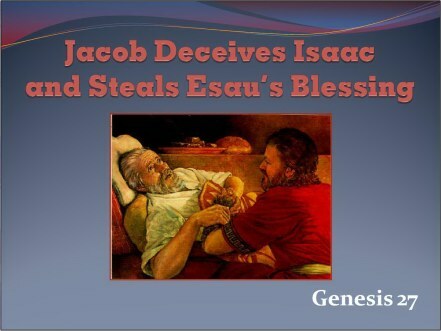 Jacob lived up to his name of supplanter and deceiver by claiming to be his brother Esau and lying to his blind father. But Isaac suspected something was wrong and sought further proof. Isaac did not recognize that it was Jacob speaking to him because his hands were hairy like those of his brother Esau. Yet, Isaac questions his son for the second time for the voice he heard was Jacob’s voice. When Jacob lies again maintaining to be Esau, the deception was completed. Isaac's eyesight has become so bad that he could not see. His sense of taste probably was also poor because he could not distinguish between goat and venison. After finishing with his meal, Isaac calls his son over to kiss him. This request may have been made in gratitude as well as out of lingering suspicions. Any doubt that Isaac may have still had was dispelled by the scent of Esau’s clothes that Jacob was wearing. The blessing by Isaac was both a prayer and a prophetic declaration that would be fulfilled by the nation of Israel. 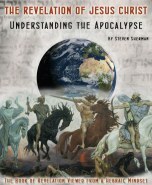 During the time of Joshua and when the judges led Israel to victory, the Canaanites were conquered by the Israelites. During King David’s reign, the Moabites, Ammonites, Syrians, Philistines, and Edomites were all in subjugation and paid tribute to Israel. The final pronouncement, “May those who curse you be cursed and those who bless you be blessed” is a partial reiteration of the LORD’S promise to Abram found in Genesis chapter 12. Isaac was amazed, astonished, and seized with a great trembling all over his body as a result of the terror and confusion of his mind caused by the craftiness of Jacob in getting the blessing he had intended to give Esau. Isaac’s fearful reaction may have also been a result of his realization of God’s providence in this matter. For Isaac now saw clearly that it was according to the divine will that Jacob should be blessed in accordance to the LORD‘s declaration that the older son will serve the younger. Esau wept loud and bitterly and blamed Jacob for taking advantage of him for the second time. Yet, it was Esau’s own carnal character that led him to despise his birthright and sell it for a hot meal. Esau’s tears were not of repentance but of self-pity. He understood that his father’s blessing upon Jacob was irrevocable and asked for a blessing of his own. God in His foreknowledge and sovereignty chose Jacob to receive the blessing reserved for the first born. His father Isaac answered him, “Your dwelling will be away from the earth’s richness, away from the dew of heaven above. You will live by the sword and you will serve your brother. Isaac’s declaration over Esau is almost the antithesis of Isaac’s blessing over Jacob. Jacob, who was content to stay at home among the tents and desired the rights and responsibilities of the first-born son, receives a blessing of agricultural abundance. Self-centered Esau, on the other hand, was a skillful hunter and a man of the open country. His descendants are destined to live on poor land and be a warlike, predatory people. The final portion of the prophetic declaration states that Esau’s offspring (the nation of Edom) would finally throw off Jacob’s yoke. This was fulfilled in the days of King Jehoram of the southern Kingdom of Judah. Like Cain, who slew his brother Abel out of jealousy because Abel received God’s favor, Esau is enraged that Jacob received his father’s blessing and planned to slay his brother. Satan was constantly attempting to thwart God’s plan of redemption by preventing the promised “seed of the woman” from being born through the prophesied lineage. Messiah was to come through Jacob’s son Judah. Rebekah was rightfully concerned that she could lose both of her sons in one day. The punishment for murder was to be the death of the murderer. Jacob would indeed flee to his uncle Laban’s home in Harran. But this was not to be for just a little while. It would be twenty years of toil and unfair treatment by Laban until Jacob’s character and name would be changed for the better and he would return to the land of Canaan. Esau had married Judith the daughter of Beeri the Hittite, and Basemath the daughter of Elon the Hittite. Although Abraham was befriended by Hittites who came to his aid in the war against the Mesopotamian kings, the Hittites, descendants of Heth, son of Canaan son of Ham, are listed among the accursed Canaanites and not the blessed line of Shem. The name Hittite is derived from the name Heth and means “sons of terror.” Esau has again shown that he is not to be trusted as the father of the “promised seed” through which all nations on earth are to be blessed. Rebekah wanted to convince Isaac to send Jacob to Harran to get a bride. In God’s sovereignty, Jacob was forced to flee for his life and would marry within his family’s clan and preserve Messiah’s line. Genesis 26 - Isaac Settles in Gerar & He Deceives Abimelech!